This book examines the transformation of the state in Central and Eastern Europe since the end of communism and adoption of market oriented reform in the early 1990s, exploring the impact of globalization and economic liberalization on the region’s states, societies and political economy. 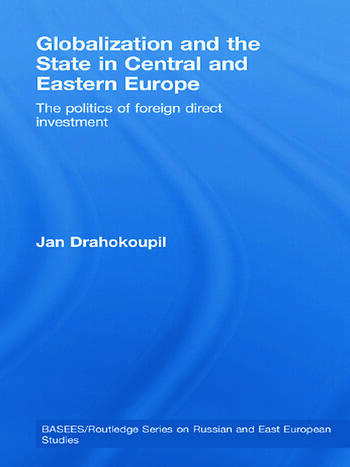 It compares the different policies and national strategies adopted by key Central and Eastern European states, including the Czech Republic, Poland, Hungary and Slovakia, showing how initial internally oriented strategies of market reform, privileging domestic sources of investment, had by the late 1990s given way to externally oriented strategies emphasising the promotion of competitiveness by attracting foreign investment. It explores the reasons behind this convergence, considering the influence of internal and external forces, and the roles of interests, institutions and ideas. It argues that internationalization of the state is forged in the processes through which domestic groups linked to transnational capital attain domestic influence necessary to shape state policy and strategy. These groups — the comprador service sector in particular — constitute and organize political, social and institutional support of the competition state in the region. Overall, this book not only provides a detailed account of the political economy of post-communist transformation in Central and Eastern Europe, but also the processes by which states adapt to the forces of globalization. Jan Drahokoupil is a research fellow at the Max Planck Institute for the Study of Societies in Cologne. He obtained a PhD at the Central European University in Budapest. His recent publications include European Neoliberal Governance and Beyond (co-edited with Bastiaan van Apeldoorn and Laura Horn).